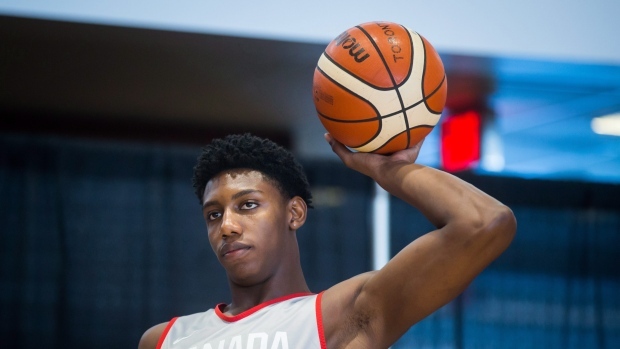 VANCOUVER — Teenager R. J. Barrett scored 16 points and had a pair of assists in his first game with the national men's basketball team as Canada defeated a team from China 97-62 Friday night in the opening game of the Pacific Rim Basketball Classic. There were some questions about how Barrett would adapt to playing against bigger and stronger senior players, but the game had barely started before the 18-year-old from Mississauga, Ont., showed the crowd at Rogers Arena he belonged on the court. On the opening possession the six-foot-seven guard moved the ball down the crowd, drove the basketball and scored on a falling layup. Later in the quarter he had the fans on their feet with a two-handed dunk on a fast break. Barrett looked calm and in control whenever he had the ball. He moved the ball well, directed players where he wanted them to go and was comfortable on defence. After attending high school in Florida, Barrett will play NCAA basketball at Duke University this year and there already is speculation he could be the top pick in the 2019 NBA draft. Canada controlled the game from the start, leading 52-31 at half time and 83-48 after three quarters. Tempers flared in the fourth quarter when Chinese coach Feng Du and Canada's Anthony Bennett were both ejected from the game. Canada opened the game with a lineup that included Barrett plus NBA players like seven-foot centre Kelly Olynyk of the Miami Heat plus forwards Dillion Brooks of the Memphis Grizzlies and Dwight Powell of the Dallas Mavericks. After starting Olynyk, from Kamloops, B.C, was used sparingly scoring four points in 10 minutes of play. Chris Boucher, a six-foot-10 forward from Montreal who was released earlier Friday by the NBA champion Golden State Warriors, was named player of the game. He had 17 points and five blocked shots. Canada and China will play again Sunday at the Save-On-Foods Memorial Centre in Victoria. The two-game series is a warmup as Canada prepares for World Cup qualifying matches against the Dominican Republic on Friday at Toronto's Ricoh Coliseum and the U.S. Virgin Islands July 2 at Ottawa's TD Place. Canada has a 3-1 record in Group D of the American Qualifiers which also consists of the Bahamas, Dominican Republic and the U.S. Virgin Islands. Each team faces the other three teams on a home and away basis with the top three teams from each group advancing to the second round. Canada can secure first place in the group by beating the Dominican Republic by at least 12 points and scoring a win over the U.S. Virgin Islands. The next round of qualifying continues with games in September, November and February 2019. The last time Canada qualified for the World Cup was 2010.